This is a birthday card I received from my family last Fall. The painting was done by my father, Terry McIlrath. He has been a professional artist since before I was born, and has been drawing, painting and sculpting fish images for just as long. Fish and art have long been parallel themes in my own life and I guess it is only natural that they have combined in many ways. I used to get a bad case of the Winter fishing blues every year. I could usually make it to February without going too crazy but eventually I’d bundle up and go looking for something to catch, which was usually nothing at all. For many fishers (especially the carp on the fly variety) Winter is a tough time of year. Even in Hawaii the storm fronts start to roll through weekly and the water temperature falls just enough that the fishing slows down noticeably. This year has been a little bit different. This year, my fishing blues are of a different kind. What do you do after a long day of fly fishing for carp on the Columbia, after dinner has been eaten and the dishes have been washed? Go fishing for smallmouth bass! Flats fishing on foot and flats fishing from a boat are fairly different experiences. Like most things, each comes with it’s own advantages and disadvantages. I have spent quite a bit of time fishing solo from an inflatable boat or SUP board, but this was the first year I have spent any meaningful time fishing from an actual boat while being poled by another person. I have yet to really get the hang of it, but I have definitely learned some important lessons, which I thought might be useful to others. The demise of our inflatable boat changed my fishing strategy. I had planned on using the boat to fish for carp on a number of backwaters and lakes connected to the Columbia River. Instead, I had to focus on places with shoreline access. Despite this turn of events, the fishing only got better and the fish only got bigger. I landed a couple of chunks and just missed one beast that was probably over thirty pounds. We are back to our regular lives in Honolulu. Back to our cat, our garden, our jobs, and back to the salt – the waves, the tides and trade winds, bonefish and papio. A month away is a long time. Significant things happen in a month, and mundane things too, like old water heaters and broken gutters. Things are lost and gained, friends met or missed, places changed or discovered. Looking for the Seven Secrets of Bass Fishing? PLANNING YOUR NEXT DIY FISHING ADVENTURE? CHECK THIS OUT! 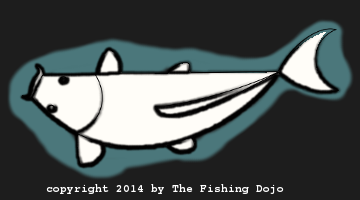 The Fishing Dojo offers a unique style and philosophy of fishing that challenges convention in pursuit of the ultimate goal: Have more fun and catch more fish!